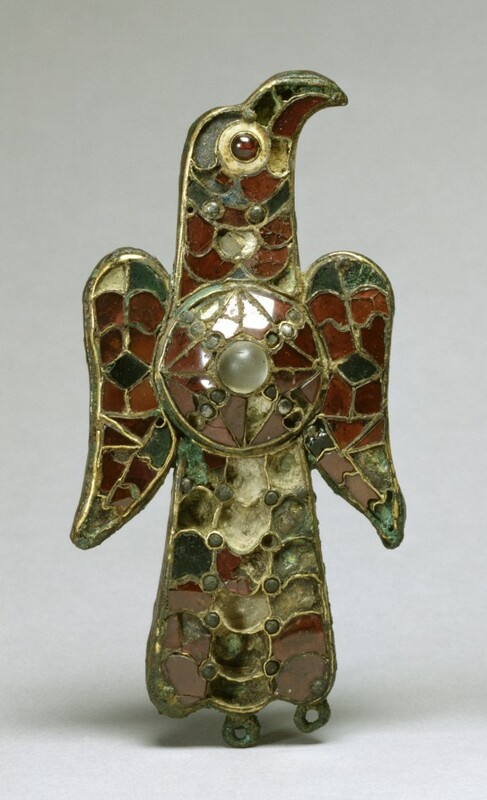 Description This object along with Walters 54.422 form a pair of superb eagle-shaped fibula found at Tierra de Barros (Badajoz, southwest Spain) made of sheet gold over bronze inlaid with garnets, amythysts, and colored glass. Pendants once dangled from the loops at the bottom. The eagle, a popular symbol during the Migration period adopted from Roman imperial insignia, was favored by the Goths. Similar eagle-shaped fibulae have been excavated from Visigothic graves in Spain and Ostrogothic graves in northern Italy, but this pair is one of the finest. These fibula would have been worn at the same time to fasten a cloak at either shoulder. 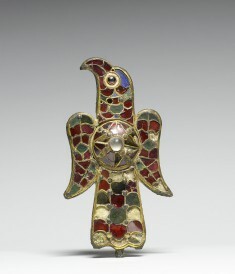 The Art of Medieval Spain a.d. 500-1200. The Metropolitan Museum of Art, New York. 1993. Art of the Dark Ages. Worcester Art Museum, Worcester. 1937. Spanish Medieval Art. The Cloisters, New York. 1954-1955. Best of Fifty. Taft Museum of Art, Cincinnati. 1977. Objects of Adornment: Five Thousand Years of Jewelry from the Walters Art Gallery, Baltimore. Cooper-Hewitt National Design Museum, New York; Chrysler Museum of Art, Norfolk; Carnegie Museum of Art, Pittsburgh; San Antonio Museum of Art, San Antonio; Philbrook Museum of Art, Tulsa; Honolulu Academy of Arts, Honolulu; New Orleans Museum of Art, New Orleans; Milwaukee Art Museum, Milwaukee; Minneapolis Institute of Art, Minneapolis; Toledo Museum of Art, Toledo; The John and Mable Ringling Museum of Art, Sarasota. 1984-1987. Jewelry from the Walters Art Gallery and the Zucker Family Collection. The Walters Art Gallery, Baltimore. 1987. To Arrest the Ravages of Time: Caring for Art at the Walters. The Walters Art Gallery, Baltimore. 1996. Bedazzled: 5,000 Years of Jewelry from the Walters Art Museum. Frist Center for the Visual Arts, Nashville; The John and Mable Ringling Museum of Art, Sarasota; The Walters Art Museum, Baltimore. 2006-2009. Bedazzled: 5,000 Years of Jewelry. El Paso Museum of Art, El Paso. 2010. Provenance [Found at Tierra de Barros, Badajoz, Estremadura, Spain]; Henri Daguerre, Paris, 1930, by purchase; Henry Walters, Baltimore, 1930, by purchase; Walters Art Museum, 1931, by bequest.